Toast to the ancients and start your own honey wine revival with this comprehensive mead making kit. Ask for mead at your local liquor store and you may be met with a puzzled look, but you can start your own honey wine revival with this comprehensive mead making kit. A golden, honey-based liquor, mead is the ancestor of all fermented beverages, originating in Asia over 9,000 years ago. It also flows through the history of the ancient world and medieval Europe, and inspires the familiar term "honeymoon" (the first month of marriage, when couples would toast with mead). 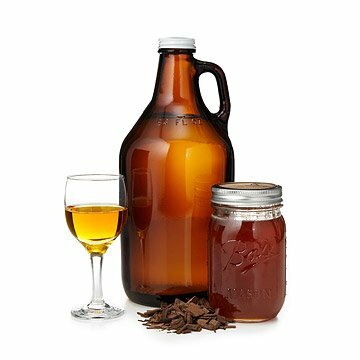 This kit makes you part of this rich and exclusive history with everything you'll need to make a half gallon of your own mead to celebrate your honeymoon or share with friends and family. Norse Hutchens' first experience with home-brewing came from watching his Dad and Uncles as they got together late on weekend nights to bring their latest homebrew recipes to life. Since then, Norse has developed a passion for home-brewing that has followed him his entire life. Since his early first experience, he has made it a personal quest to seek out, research, and explore the best ways to make the most flavorful and satisfying home brew recipes. With the help of a community of friends and Brew Masters from across the nation Norse has put together a number of kits that compile years of collective experience and trade secrets. Each of the kits that are offered highlight an approachable recipe and method that are meant to lead the beginner into the complex craft of home brewing, while also offering the veteran a satisfying experience with a delicious result. Store in a temperature controlled environment. Ingredients make 1/2 gallon of mead. Equipment can be reused to make many more batches. Warning: Home brewing additives and ingredients may cause harm if used other than as labeled. My husband really likes mead and he enjoyed the opportunity to brew it at home on his own! Although the kit was complete, the glass itself arrived shattered. When I spoke to customer service and explained the situation, they resent a replacement kit without the glass! Was hoping for a better outcome for something that was supposed to be a gift for my sister. Nice starter kit for beginners. The kit itself was great. Better off ordering this off another site . I would not order from uncommon goods again. Customer service was rude and unprofessional when we called. Acted like we were an inconvenience for calling. I gave as a gift to my grandson. This was a unique, fun, and thoughtful gift. However, the yeast was supposed to be kept cold, and we didn't realize that until the gift was opened. Overall, this was an amazing product and I will definitely consider buying more of these kits. My son was very happy to receive this kit. Given as a gift and it was well received and person enjoyed the process of making mead - and the history of the brew. My husband was happy to get this as a father's day gift! Hven't used it yet, but my husband brews his own beer and had wanted to try mead so this is perfect for trying it out!